Camp Branch Campground closed October 1, 2018 and will reopen April 1, 2019. Continue to enjoy these last few weeks of camping and thank you for a wonderful season. We appreciate your patronage! Clay County Parks, Recreation, Historic Sites manages more than 6,000 acres of parks including 2 championship golf courses, 24 miles of trails, 777 camp sites, 2 marinas, swim beaches, docks and shelters at Smithville Lake. As well as two renowned museums and other historic sites, and two parks – Rocky Hollow and Tryst Falls - between Kearney and Excelsior Springs. 362 camp sites are available at Camp Branch off Collins Road at Smithville Lake. Both tent and RV sites are available with several including electrical hook-ups. Many sites are located along the shoreline with easy access to walking trails. Shower and laundry facilities are conveniently located in the campground. Many sites are located along the shoreline where you could bank your boat at your own risk. Firewood and bagged ice are available for sale while camp hosts are on duty. All sites have a picnic table and a firing with grill. A Loop offers camping sites accommodating both equestrian and non-equestrian campers. Non-equestrian campers that love camping in A Loop; non-equestrian friends and family wishing to camp close to an equestrian camper is now able! Non- equestrian campers will just need to stop by the Camp Host Booth, the Parks Office or give the Parks Office a call and we will be happy to make the reservation for you. Equestrian campers wishing to make a reservation, please utilize the reservations website for your camping needs. 415 camp sites are available at Crow's Creek off E Highway at Smithville Lake. Both tent and RV sites are available with several including electrical hook-ups. Loop A offers sites that are designated for our equestrian campers. See equestrian section below. Playground conveniently located in center of campground. All sites have a picnic table and a fire ring with grill. Camping fees include park entry fees for one vehicle. Please note that an online camp site reservation system is in place since April 2015. If there is not an attendant on duty, and you are arriving after 5:00pm, please arrange to contact Clay County Parks in the morning (8:00am or later), in order to pay your camping fees and minimize the risk that another guest reserved the site you chose. If you are leaving the next day, or if you are only staying for a day visit, and no camp host is on duty, please pay the Daily Entry Fee in the HONOR BOX provide at each entry station. Any non-reserved camp sites will continue to be sold on a first-come-first-serve basis. Same day walk-in may stay one night during weekends regardless of type of site. Same day walk-in is a first come, first serve basis. Customers who arrive after hours are advised to contact Clay County Parks in the morning to minimize the possibility of a conflict with a reservation that may have occurred in the meantime. If scheduling conflicts do occur, reasonable efforts will be made to ensure the best outcome for both parties. If this is not possible for any reason, the customer without reservation may have to be relocated. In order to avoid this possibility altogether, please use the online reservation system. *: Must provide proof of payment for 2017 Personal Property Tax. One (1) discounted pass per account. Must be purchased at Parks Office (Camp Branch). Taxpayer discount expires on July31st due to half price sale begins August 1st. One vehicle entry fee is included with your camping fee. Additional vehicles (incl. motorcycles) will require a daily vehice entry fee pass; per vehicle per day, or possession of a Season Vehicle Pass or Season Combo Pass (one per vehicle). No more than 3 axled units per site permitted. We offer additional parking in the parking lot located at the shower houses. Crow's Creek Campground also offer overflow parking near Loop E or in the gravel lots accross from Loop C. You may also purchase additional campsites to accommodate your needs. BOATS: All boats must possess either a Season Boat Pass or a Season Combo Pass or purchase a daily boat pass upon entering the parks. Your camping fee does not include your boat. Clay County Parks Department operates and maintains two public swim beaches at Smithville Lake. The beaches are located within Camp Branch and Little Platte Parks. Both beaches are open to the public daily from May 1st through September 15th from 8:30am to sunset. Facilities include showers, changing rooms, restroom, and drinking fountain. There is no life guard on duty. Pets, glass containers, and alcoholic beverages are not permitted. Camp Branch Beach is located on the east side of the lake within Camp Branch Bauman Park across the parking lot from the Park Office, Camp Branch Marina and Boat Launch. In addition to access by vehicle, Camp Branch Beach is also accessible from Camp Branch Campground via Bonebender Trail. Little Platte beach is located within Little Platte Park on the west side of the lake and is accessed from 180th Street. Access is by vehicle and via the new Little Platte Trail. In addition to the professionally designed Paradise Pointe Disc Golf Complex, a 9-hole disc golf course is located within Camp Branch Campground. This Par 27 recreational course is good for beginners. 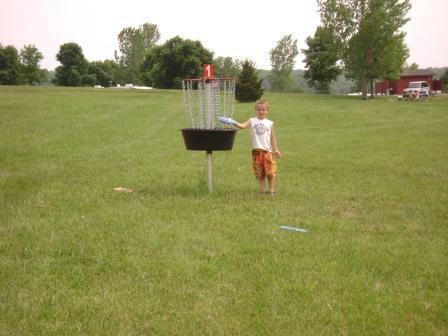 The Paradise Pointe Disc Golf Complex is located within Little Platte Park. Beaver Creek - White Course, Par 56. 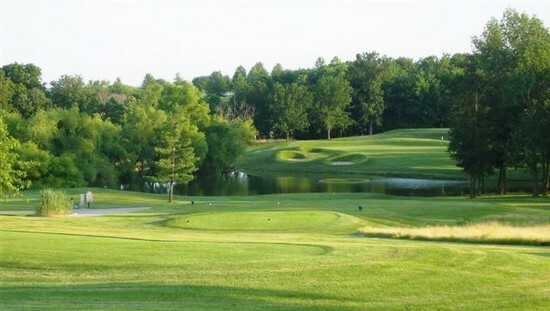 Black Thorn - Blue Course, Par 56-60. Woodhenge - Yellow Course, Par 62-65. Note: At the bottom of each basket is a pointer to the next tee-pad. The ADA fishing dock, pictured above, is located at Crows Creek boat launch. This shelter and dock are only available for resevations by organized handicap groups that require ADA accessibility (ex. Rehab. Institute). Please call the Park Office for more details at (816) 407-3400. Fishing habitat is plentiful at Smithville Lake. More than 4,000 of the lake's 7,190 water surface acres were left uncleared to create the aquatic habitat that should provide excellent fishing. The Missouri Department of Conservation began stocking the lake in 1975 and continues to this day. Species include largemouth bass, white bass, channel catfish, blue catfish, flathead catfish, walleye, white crappie and bluegill. 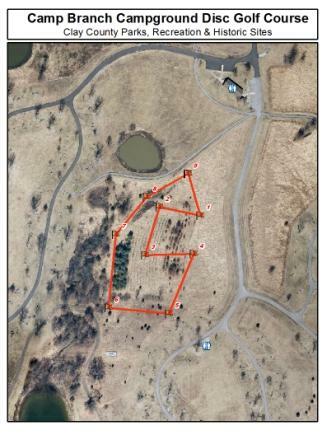 The public may hunt on more than 7,000 acres of Smithville Lake's wildlife management area. Hunting on Park property is prohibited, unless participating in one of the Parks Managed Hunts. The wildlife management area is open to all hunting seasons in accordance with the Missouri Department of Conservation. However, about 2,200 acres of land and water in the Honker Cove Waterfowl Refuge are closed seasonally to boating, hunting, trapping and fishing from October 15 to January 31. The Camp Branch Marina Store has fishing boats and pontoon boats for rent. Customers may also purchase: boating accessories, life jackets, swim flags, batteries, fishing tackle, bait, ice, snacks, drinks, fuel, fishing and hunting licenses. Covered overnight boat slips are available along with 212 covered boat slips that can be leased in 6 month increments. Camp Branch is located near the swimming beach, Camp Branch Campground, boat ramps, walking trails, trapshooting park and picnic sites. The Paradise Pointe Marina Store also operated by Clay County Parks, is located within Little Platte Park. Customers may purchase: boating accessories, life jackets, swim flags, batteries, fishing tackle, bait, ice, fuel, snacks, drinks and much more. Overnight boat slips are available along with 240 covered boat slips and 29 uncovered boat slips that can be leased in 6 month increments. Paradise Pointe Marina is located near the swimming beach, boat ramps, walking trails, picnic sites, playground, historic Woodhenge and Akers Cemetery, disc golf courses, and Paradise Pointe Golf Complex. Sailboat Cove is ideal for sailors, picnickers, sightseers and fishermen. Sailboat Cove is open to the public; with the exception of the docks, mooring buoys and dry storage facility areas. The Day Sail area of Sailboat Cove is an excellent place for launching catamarans, small sail boats and wind surfing. Ramp usage at Sailboat Cove is exclusively for the launching of sailboats. Large sail boats must use the ramp north of the parking lot which is specially designed for them. There are picnic tables and grills, as well as access to walking trails nearby. There is also a restroom and shower facility that is open year round. The Smoke & Davey Trail System is composed of three trails and is 4.8 miles in length accessible from Highway W to the north and from Sailboat Cove to the south. The Bonebender Trail System is composed of two trails and is 8.9 miles in length accessible from Sailboat Cove to the north and from the Park Office to the South. The Crows Creek Trail System is composed of two trails 8.9 miles in length accessible from Collins Road to the north, the Crows Creek Boat Ramp and Access 25 off 160th Street to the south. Smithville Lake offers 26 miles of horse/primitive hiking trails on the southeast side of the lake. The trail begins at Crows Creek Campground and ends in Arley, Missouri. The area features a mix of rolling and flat terrain with many creek crossings. Fields of native warm-season grasses, wildflowers and row crops are scattered among the timbered areas. The primary trailheads at Crows Nest and Jack Rabbit Bend offer ample trailer parking. Crows Creek offers 81 Electric (50 amp) and 9 Electric/Water (50 amp) camping sites for equestrian patrons. Restrooms, showers, laundry and water hydrants are conveniently located. Orange indicators mark the shoreline trail and white indicators mark the boundary trail. Lettered locator posts have been placed along the trail to help riders reference their location on the map. The trails east of Collins Road are located within Public Hunting Areas. Please use caution during hunting seasons. Mowing and trail improvements are provided by volunteers. To volunteer or make a donation, please contact Northland Trails and Greenways. The Clay County Grassland Revitalization Project recreates prairie and savanna landscapes at Smithville Lake. 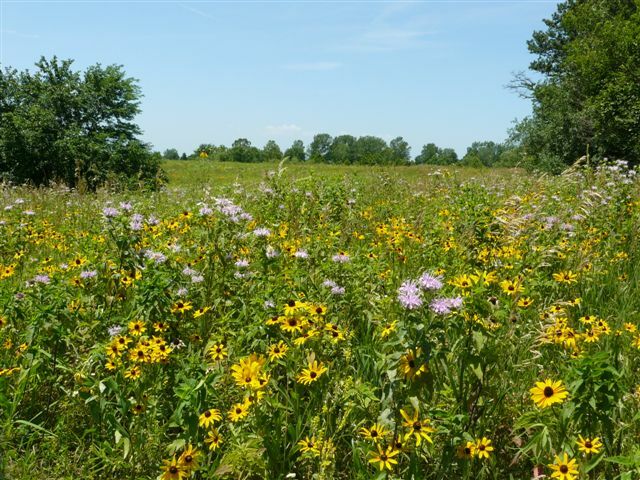 The project has four goals: to recreate a grassland plant and wildlife community from pastureland; to recreate a savanna and dry woodland plant and wildlife community from degraded savanna and woodland areas; improve habitat for concerned wildlife species such as Indiana Bat, Northern Bobwhite, Henslow's Sparrow, and Honeybee, to name a few; and to create a positive public outlook on conservation awareness of critical terrestrial plant communities, threatened and endangered wildlife species, and wildlife habitat management practices. The recreated grasslands and savannas in Clay County Parks will provide numerous other benefits such as soil enrichment, erosion control, invasive plant species control, sequestering of carbon, enhancement of wildlife habitat, reduction of departmental labor and material costs, and added aesthetic value to the parks. The Clay County Grassland Revitalization Project has been funded and supported by the United States Army Corp of Engineers, Missouri Department of Conservation, Missouri Prairie Foundation, Missouri Bird Conservation Initiative, George Clark Missouri State Chapter of the National Wild Turkey Federation, and WIN for KC. If you would like more information or would like to become involved, please contact Aaron Kagay at (816) 407-3400. The Paradise Pointe Golf Complex offers two challenging, 18 hole courses and a four hole Academy course. The complex is also a great place to host events and weddings. Paradise Pointe was awarded Wedding Wire' Bride's Choice award for Ceremony and Reception venue in 2010 and 11, recognizing the facility as one of the top in the country. Paradise Pointe has their own website at www.paradisepointegolf.com.